After the battle of Nicholson's Neck, two men from the Mountain Battery were apparently found by local zulus and sent to Chief Khumalo at Driefontein. They were cared for and hidden there from the Boers until March 1900 when they were taken back into Ladysmith, after it was relieved. Does anyone have any further information on this fascinating story? From: The Natal Campaign. "A sacrifice betrayed" by Hugh Rethman. August 2017 page 160. The battle of Nicholson's Nek was fought on October 30th, 1899 outside Ladysmith and just before the town was besieged. The unit is 10th Mountain Battery Royal Garrison Artillery. Ladysmith was relieved on February 28th, 1900. No similar mention for Gnr Adams has been traced. Using the medal rolls, a crucial resource in determining what happened to casualties, neither man earned the Defence of Ladysmith clasp. So, if they weren't in Ladysmith why weren't they in a POW camp in the Transvaal? Back to the medal rolls, Adams earned the clasp for Laings' Nek, the qualifying period being June 2nd-9th, 1900. The first POWs were not released until June 6th. It is highly unlikely for Adams to have been released on the 6th and sent back to his unit in the front line before the 9th. Most prisoners were not fit for service. As POWs they lived on short rations, in tin huts with limited medical care. Bradley earned the single clasp Natal, he did not earn a clasp for the Transvaal like many of his comrades who were POWs did. 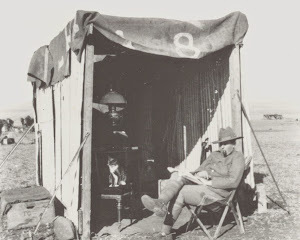 Adams did earn the Transvaal and Orange Free State clasps, but his presence at Laing's Nek proves beyond doubt he was not a POW in the Transvaal. So, where these men guests of the Zulu for five months? Service papers exist for both men but agonisingly they make no mention of such an episode. More work is required, but it is certain they were not POWs in the Transvaal and Bradley was certainly not with the Army until he turned up in Ladysmith in April 1900. Image reproduced from The Times Digital Archive.